This article is the second of a three-part series on Russia as a Pacific power. See part one here. Moscow has unleashed an intensive charm offensive in East Asia since last month’s APEC conference, during which time Russian officials have gone to great lengths to show that Moscow’s brief period of internal weakness and isolation from Asia has come to an end. Soon after the Vladivostok summit, Russia announced that it was writing off most of North Korea’s Soviet era-debt (worth $11 billion). Later in September, Russia hosted an energy conference in Sakhalin, its territory to the north of Japan, where Gazprom intends to invest more than $14 billion to further expand its energy sales in Eastern Asia. Finally, another government official speaking at a recent business conference in Singapore expressed Russia’s intention to increase trade links with Asia to the point where Asian markets are the destination for half of Moscow’s exports, or over $250 billion in current trade. 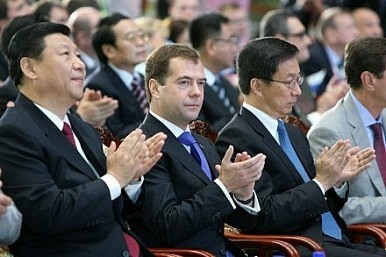 Russia will start by negotiating a free trade agreement with Vietnam next year. Russia’s reawakening as a Pacific power is a matter of consequence for us all. As I suggested in my last piece, however, there are many outdated assumptions on Russia’s role in Asia. One such myth, which I discussed in the last piece, is that Russia has traditionally had little to do with Asia. This week, I assess another misleading idea about the northern giant: that Russia is a strategically impotent bear in international relations generally, and in Asia specifically. This may have been true, once upon a time. But not so anymore; and it will only seem more absurd in the future. This argument doesn’t stand up to close scrutiny. Kelly’s antipathy towards Putin’s cult of personality and his strong-man political system is a major premise of his wholesale dismissal of Russia’s great power status. But Putin and Russia make two. A leader does not create a nation’s power, but only reflects it. It might be a distinctly obstructionist type of power, but Russia is still a great power. Many nostalgically hold on to Helmut Schmidt’s dismissal of Russia as an Upper Volta with missiles, as he once called the USSR. But let us not mistake emotion-laden ideological enmity for cold-eyed geopolitical analysis, and the objectivity of facts. Great powers are so as a result of their capabilities, resources and international status. George Orwell’s fictitious superpowers – Oceania, Eurasia and Eastasia – were so powerful precisely due to their aggregate resources, the inability of any of them to beat an alliance of the other two, and despite their authoritarian forms of government. So it is with Russia. A future democratic Russia might be more dynamic and even more powerful, but for now the region must deal with Russia as it currently is, not as we wish or hope it to become. Understanding Russia’s place in Asia requires an appreciation of its geopolitical uniqueness. In particular, its location situated at the nexus of Europe and Asia. In modern history, Moscow has concentrated the bulk of its military, economic and intellectual resources on its western and southern vector, to trade with, and defend itself again the lands on this periphery. And this emphasis on Russia’s Western interests and identity drained finite military and economic resources away from the east, resulting in a much smaller Russian presence on its Asian flank. We may now be witnessing another historical oscillation of Russia from a Eurasian continental power to a double-headed great power. Straddling, as it does, both Europe and Asia, the present historical power shift from West to East is almost existential for Russia. Peter the Great’s European cultural homeland is stagnating; Asia, in stark contrast, is booming economically, while balkanizing geopolitically. A recent publication by the influential Valdai Group, entitled Towards the Great Ocean, provides a fascinating insight into the shifting attitudes of Russian elites towards the Asia-Pacific. A bold recommendation from the report advocates physically relocating a part of the Russian capital to Vladivostok – the Pacific coast city which is closer to Melanesia than it is to Moscow – and proclaiming it a co-capital alongside Russia’s two historical capitals. “But the 20th century is already the distant past, and Russia is a nuclear power; giving more authority to Vladivostok would clearly convey Russia’s unyielding commitment to peace and cooperation with China…” (Emphasis added). Interestingly, the geographic coordinates of the hypothetical attack the authors envison suggest relocating the capital might have the opposite effect with regards to Sino-Russian relations. Moscow is pivoting to Asia out of its primary national interest: survival. If Russia is to assure its economic and military security in an uncertain future, it must do so in the great ocean. Some analysts have written off Russia’s claim to being an Asia-Pacific power. They do so at their peril.